Ryan Kwanten, Leslie Bibb and Amy Smart star in the long-delayed supernatural thriller 7500, originally scheduled to be released in 2012. Watch the movie trailer for 7500 below. A married couple and their two best friends board a plane bound for Japan, but they experience some supernatural turbulence when the aircraft comes under attack from unearthly forces. MPAA Rating: PG-13 for thematic material, some scary images and brief language. 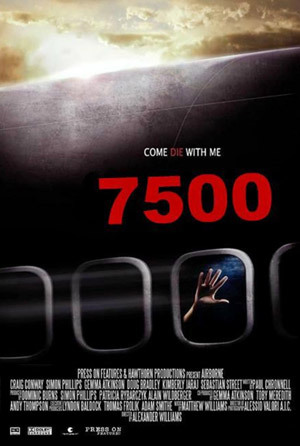 7500 is the chilling story of a group of passengers who encounter what appears to be a supernatural force while on a transpacific flight. A married couple (Ryan Kwanten and Amy Smart) and their two best friends board a plane bound for Japan, but they experience some supernatural turbulence when the aircraft comes under attack from unearthly forces in this tale of terror from director Takashi Shimizu (The Grudge). Meanwhile, a flight attendant (Leslie Bibb) ponders the potential repercussions of a complex, clandestine relationship.